A grey old day dawns but it's mostly a driving day between Restoule and Sault Ste Marie. 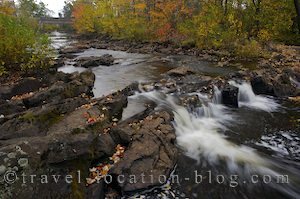 Driving back out from the Restoule Provincial Park, we stopped off by the Restoule River for a brief photo shoot of the river terraces, boulders, and scenery - it was just beautiful! The couple of white swans up river made it all the more pretty and serene! Afterwards we set off again - another day of driving - all day!! I'm not sure if we've ever mentioned, but Canada is huge and Ontario seems to go on forever! From Restoule we made a beeline for Sault Ste Marie situated between Lakes Superior and Huron. We would spend the night beyond Sault Ste Marie, but we wanted to spend some time there photographing. We arrived at the Soo Locks in time for sunset but it took us the whole day to get there and we drove almost constantly.